LONDON, England (CNN) -- A campaigner for a British grandmother on death row in Texas made a unique plea for her life Thursday -- from atop a plinth in London's Trafalgar Square. 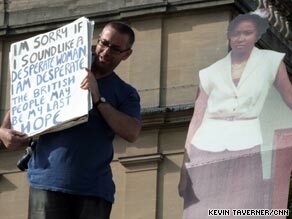 Brian Capaloff uses his slot on the plinth in Trafalgar Square to campaign for clemency for Linda Carty. Linda Carty, 51, recorded her message this week from the prison in Gatesville, where she is serving her sentence, as part of an effort to win clemency. Campaigners say Carty's trial was "catastrophically flawed" and that her court-appointed lawyer failed to take steps that could have at least spared her the death penalty. An appeal is pending in the 5th U.S. Circuit Court of Appeals. "I'm sorry if I sound like a desperate woman," she said on the tape. "I am desperate. The British people may be my last hope." "Please listen and tell everyone you know," Carty said in her message. "Please don't let me die here." A contest currently under way in London allows members of the public to win an hour atop the empty plinth in Trafalgar Square. Winners can do anything during their hour that they like -- perform, demonstrate, speak, or simply be silent. Brian Capaloff, 46, who works for a local government homelessness service in Scotland, won a slot but couldn't think of what he would do during his hour. He said he asked Reprieve, a British charity that he supports, whether he could do anything for them, and they suggested he focus on Carty's case. "I thought that was the most important thing of all -- to stop someone who is not guilty beyond a reasonable doubt, who I believe is innocent, of being executed," Capaloff told CNN. It's "just an unbelievable injustice." He said he hoped his demonstration would lead people to inquire about the case and ask their members of Parliament to do the same. "Linda Carty's speech to Trafalgar Square shows that she is a terrified woman, and with good reason," said Clive Stafford Smith, director of Reprieve. "Texas plans to kill her by lethal injection, which is a painful and lonely death." He added: "The British government must do everything in its power to prevent Linda's death." The British Foreign Office has filed two amicus briefs in Carty's case complaining that Britain was not notified of her original arrest, said a Foreign Office spokesman, who declined to be named in line with policy. The first was in 2006 with a U.S. district court in Texas and the second was in May of this year with the federal appeals court. The Foreign Office is also in close touch with Carty and her legal representatives, the spokesman said. Carty was convicted of taking part in the May 2001 murder of Joana Rodriguez, a 25-year-old Texas woman, Reprieve said. Rodriguez and her 4-day-old son were abducted by men demanding drugs and cash; she later suffocated while her son survived. Prosecutors said Carty had hired the men to kidnap Rodriguez so she could steal her baby because, even though Carty had given birth to children in the past, she was no longer able to get pregnant, Reprieve said. Carty, who asserts her innocence, was sentenced to death in February 2002. Reprieve said Carty's court-appointed lawyer was incompetent. The lawyer failed to meet Carty until immediately before the trial, failed to spot flaws and inconsistencies in the prosecution's case, failed to interview witnesses and did not look at key mitigating evidence, Reprieve said. "My lawyer told me he was too busy to work on my case," Carty said in her recording. Carty was born on the Caribbean island of St. Kitts to Anguillan parents and holds a British passport, Reprieve said. She worked as a primary school teacher in St. Kitts, a former British colony, until she was 23 and later moved to Texas. "After her conviction, investigators from Reprieve visited St. Kitts and learned that Linda was still remembered as a passionate teacher who frequently held extra classes for children with special needs. She also taught at Sunday school, sang in a national youth choir and led a volunteer social-work group," Reprieve said. "This information would have enabled (her lawyer) to present her to the jurors as a dedicated teacher and community leader -- factors that might well have induced them to vote to spare her life." Carty worked as a confidential informant for the U.S. Drug Enforcement Agency during the 1980s, befriending suspected traffickers to get information and sometimes to make test purchases of drugs, Reprieve said. Carty believes that she was framed because of her work with the agency, Reprieve said. Lawyers for Carty have lodged an appeal with the appeals court court in New Orleans, Louisiana, Reprieve said. If the court rejects her appeal, an execution date will be set, the charity said. Capaloff said he had a lump in his throat when he arrived at Trafalgar Square for his demonstration. "This is about someone's life and there's nothing more important than that," he told CNN. "It is an emotional thing." Only three of Trafalgar Square's four plinths have statues on top. The fourth plinth never had a statue and has stood empty for years, with specially commissioned artworks occasionally being featured on top. This year, sculptor Antony Gormley came up with the idea to have people stand atop the plinth as a sort of living monument. Thousands applied for the chance to occupy the plinth. The project runs 24 hours a day. It began in July and is set to end in October.